Have you ever bought a cream or facial wash, and it just bombs on you? Yeah, that used to happen to me I understand how you feel. I still happens to me. It usually means that you did not get the right skincare product for your skin type. With so many skincare products, how will you know which is the right one for you? First, let's start by analyzing your skin. Ok, not really analyzing it, but more like observing it. I'm not an expert, nor am I an Esthetician, but I do have experience. My skin has gone through so many changes, I feel like it's a chameleon. Now that I am in my very early young 30s (LoL), and I live in a state with a warmer climate, my skin has become oily combination. My skin was drier when I lived in the north east of the US. Unfornately, right now, it's breaking out, and I'm seeing fine lines around my eyes. * sharp gasp* My pores are bigger in this HOT weather, making it more clogged. But wait, how do I know that my skin is oily combination? I observe, stare, and get up-close and personal with my face. Seriously, it does help, though, knowing what type of skin you have, so that you can take better care of it. If you don't know, or you want to make sure, what skin type you are, let's answer a few questions. Yeah? Alright. Before you answer, I just want to reiterate that I am not an expert, nor am I dermatologist. These questions just helps me figure out skin types. Does the skin all over your face, or just parts of your face, feel tight after washing or taking a shower/bath? Is your face rough, and/or flakey? Or dull? Does your skin start to look shiny all over, or just parts of your skin, an hour after washing your face? Where do they usually appear on your face? Does it appear around a certain time of the month? Does your skin get irritated easily, or becomes red when you use creams or skincare products? Have you answered the questions? Yey! If you answered yes to number 1 & 2, but no to number 3 &4, then you have dry skin. People with dry skin feel a tightness all over their face, even after a shower/bath. Dry skin is usually dull, cracked, and flakey. Tip: don't wash your face with hot water, or cold. It is too drying, and damaging to the skin. Use luke warm water, instead. Also use products that are moisturizing, nourishing, and hydrating, like products that have Adlay or Camellia, or avocado, which is deeply moisturizing. If you answered no to number 1 &2, but yes to number 3 & 4, then you have Oily skin. Tip 1: an hour after washing your face, take a clean tissue and dab it on your nose for a few seconds. If you see oil on it, then you have oily skin, which is also, technically, dry dehydrated skin. There will be oil on the tissue, even if you're inside your house with the a/c on. Tip 2: Also, further drying your skin will only make your sebaceous glands produce more. Hydration is the key. Tip: You need a combination of products that will help you control the oil on the T-zone, but will not dry out your U-zone. One ingredient that is usually used in Asian Skincare is green tea. If you don't know how to answer question 4 , look in the mirror, do you see little indents on and around cheeks, those are your pores. If you can see them well, then you have large pores. Tip 1: Most people with oily/dry, dehydrated skin, usually have large pores. Keep your pores clean with a detox wash off mask, or clay mask. Tip 2: don't forget to exfoliate 2-3x a week to get rid off dead skin cells that could potentially get stuck in your pores. If you answered yes to number 5, acne prone skin. Tip: Oily skin, or dry dehydrated skin, is also closely related to acne prone skin, because the pores are more open due to the skin trying to produce more oil, which attracts more dirt, dust, environmental impurities, which clogs the pores. If you answered that you have pimples on your chin at a certain time of the month (like during menstruation), you may have hormonal acne, which are sometimes cystic. 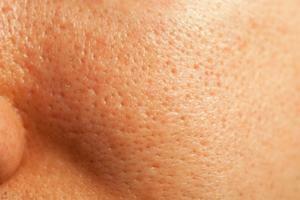 This is trickier than your regular pimples. Some see a doctor to help this, and are usually given prescription, when their hormonal acne just won't go away. If it goes away after a few days, then you can still help your skin by keeping it clean, and treating it like a queen. Hydrate, inside and out, and cut back on sugary stuff. I don't have a photo for hormonal acne, because it may be too graphic, and too much for some to look at. Google will help you, should you decide to look for a photo. If you answered yes to number 6, then you have sensitive skin. Regardless of the amount of oil or dryness your skin has, your skin can still have sensitivity. Then you are one of the lucky ones. The ones blessed by the universe. Extra tip: Exercise. Your body needs to just let it out. Get your blood moving. I mean, you know, it needs to circulate. This help with your skin tone (no more dullness! ), better at scar healing, and a better blood circulation helps our lymphatic system eliminate toxins that are secreted through the skin. Not mention, a better blood circulation also helps the body to transport collagen into the skin cells better. You can be Dry skin with dull and flakey skin. You can be combination skin with large pores on the cheeks. You can be oily, acne prone skin. You can dry and sensitive skin, or vice versa, oily, acne prome and sensitive. You can be normal to oily, or normal to dry skin. You can even be very dry skinned. You can be any of these. The fact still remains, that knowing your skin, and how it reacts to products is one of the best ways to help keep your skin healthy. Keep an eye on your skin. Not just your face, but your body as well. I'm not going to include mature and aging, because that is already obvious, and it depends on your age. I mentioned in my previous post (Can not washing you skin cause premature aging series), mature and aging, is also due to dry skin, and as we get older our skin begins to decrease in collagen production and our skin becomes more wrinkled and dry. Also, keep in mind that if you do take medication of any kind, especially the ones that alter hormones, it could also be a factor as to why you have that skin type. I suggest seeing your doctor. Ask questions about your skin, your health, and ask about the medication. Doctors love it, I think. So, know your skin, love your skin, and your skin will love you. It will envelope you in a warm fluffy embrace, and give you chocolate, and beauty in return. Well, no, not really. There is no chocolate. Ok, enough with corny, cheesy stuff. See you on my next post! Update 8.1.2016: Winner will be announced tonight. Winner must reply, DM on instagram, within 48 hours. If no reply is received, then a new winner will be drawn and announced. It's the Bae's Birthday month, and I wanted to celebrate with the all of you. I had posted this on my instagram, but since I wanted to give everyone a chance, I thought of posting this on my blog, too. For more points, I had said that they need to follow my blog. This blog. Yup. It's the Bae's birthday month, and I wanted to celebrate a little with you guys. So, I decided to so a small giveaway. It's much smaller than my first giveaway, but I will be adding a few goodies to the pack before shipping, which will be a surprise. 4. Extra 3 points: repost and add#HBDAYBAE. Follow my blog TheSheetMaskLady .com for 5 more points. Pls leave a comment "Followed" on my instagram photo. Giveaway runs from 7.12.2016 - 7.30.2016. This an International giveaway. If USPS ships to your country, then you're good. Once received, please post a picture in your feed to confirm and tag me. Do not DM me the picture. Your IG account must be public, or I will not be able to see the photo. This giveaway is not affiliated to Instagram, and the brands of the products in the giveaway. I am not responsible for the giveaway package once it has been shipped. I will be including few more goodies, which will be a surprise. If you do follow my blog, there will be another extra 5 points for commenting below in the comment section. The past week have been a bit of a blur, especially after the passing of a little family member. I just didn't feel like blogging. If I had blogged during those days, it was probably because it was mandatory, and my post probably looked like poop. I was, however, active in my social media accounts. Made me feel like I was in another world. Anyway, what sheet mask have I tried lately? A LOT, but I will talk about this one. Yup, another My Scheming mask. I chose this mask to compare it to the DearPacker Jeju Flower in Camellia. "My scheming is a brand is aTaiwanese brand, but can most likely be found in most Asian countries. There were rumors that MBD, or My Beauty Diary, and My Scheming are from the same company, but I'm sure they are not. Both brands carry very similar sheet, and silk masks, is all. I believe each country who carry MS sheet, or silk masks, has their own version of My Scheming that you can't find anywhere else, AND Watson's carries these masks. " Camellia Japonica, or Tsubaki in Japanese, is the Japanese rose. Check out my review on the DearPacker Jeju Flower Camellia to read more about Tsubaki or the Camellia. Improves skin hydration, revitalizes, and soothes the skin. It helps give the face that smooth and radiant effect. List of ingredients:And potential irritants according to CosDNA.com. I hope you all can read it. It may be blurry. Click here if you want to know how to read the photo blow. It was slightly milky, and tacky to the touch, but it was easily absorbed into my skin, It didn't have much of a smell; just a very light one, which didn't really remind me of Camellias. This was a bit disappointing. After trying DearPacker's Jeju Flower Camellia, I had half expected this to smell almost as good, or like the flower itself. The fit for this mask was a bit weird. Not that it did not fit, but more like the cut on one side was longer than the other. The sheet on the right side of my face, particularly my cheeks, had too much, while the other was just the right amount of mask. I guess it depends on the machines, or people who make the sheet masks. The eyes and mouth holes, however, were perfect. All standard, or regular, My scheming sheet masks are made of the same material, except of course the silk masks, and jelly masks. Organize the sheet mask on le face, yes organize. Sometimes sheet masking is tricky. Accoding to CosDNA, there are a few acne triggers and irritants, but my skin did not have any bad reactions at all. In fact, I wish it could have done more. Honestly, I may have set this sheet mask to fail; because DearPacker. 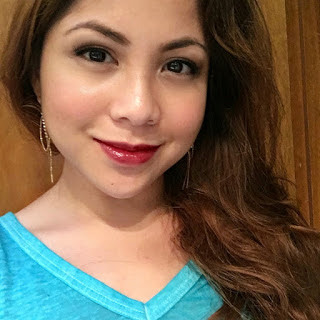 Well, it didn't fail completely, my skin was really well hydrated, and I did feel like my skin had a bit of radiant glow, but the little redness I had on my chin and top parts of the apples of my cheeks were still pink. I liked this sheet mask, but the DearPacker gave me much more OMPH. 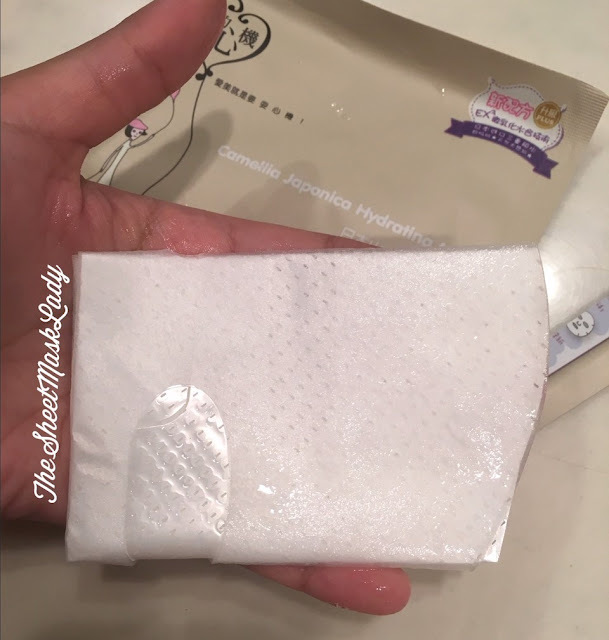 With the DearPacker version of the Camellia sheet mask, my skin felt hydrated, it just sucked up all the essence, my skin felt softer, and I had a glow that lasted till the morning I woke up. The lovely Camellia scent is a complete plus, which helped me feel relaxed, and happy. I kind of feel bad for My Scheming Camellia Japonica Hydrating mask now because I was expecting a bit more from it. Just reiterating what I posted on Instagram, because Beauteque had relaunched as Beauteque: your mask marketplace. I do love my sheet masks. Hmm. I got mine from beautequeofficial. Looking for a mask has never been easier on beauteque.com! You search via ingredient, skin concern, mask type, mask fabric, and mask brand. Speaking of brands, they have over 800+ masks on the website! From the trendiest to the classics! Not sure what mask is for you? Beauteque also offers information and education on how to use masks. If you're still not sure, they offer live chat services and opportunities to speak with a consultant to learn more about your skin and which mask suits you. .
And did I mention that they also offer a variety of mask sets that cater to skin concern, mask sets from a specific brand, and even themed sets. Check out Beauteque.com for more information, AND for awesome deals on their products! Check out my social media down below. Links and credits are included in this post, which will redirect you to owners of said pictures.